Over the last umpteen years, the term “values” has been tossed about in the cultural, political, and religious venues, mostly to profess who has more values than anyone else. Today, I’m going to talk with you about fundamental values in the art/creativity world. In art, the term ‘values’ refers to the varying shades of color from the lightest lights to the darkest darks. Without values, our creations would be bland and flat. It’s values that give art their depth and dimension. I made a simple 5-block color chart showing the step-by-step conversion from white to black. This can be done for any color, but black and white are the most effective way to make the point. The biggest fear I notice when people color/paint is being bold with their darker shades. Mainly it’s because they are usually up close to their work when they are coloring/painting that it looks to drastic and too bold. When I ask them to step back and then look at it, then they see how it actually enhances their art rather than harms it. I’m constantly telling people to “be bold!” The more contrasting values you use in your painting, the more interesting it will be. It’s the lights and darks that help differentiate between different objects in your painting. They create depth and dimension. In general, lighter shades will appear closer, while darker colors tend to recede. With regard to atmospheric perspective (a topic for another day), the opposite is true. Create your own 5-block gray scale like the one in the image above. I used prismacolor pencils to create that chart. Almost any good quality pencil that claims you can blend colors will work also.The best way to approach it is to color white in on one end and then black in the opposite end. Then in the middle block color in equal amounts of white and black to create a color that looks half way between white and black. Then proceed to color in the lighter gray color by coloring in more white than black. The color the darker gray by coloring in more black than white.If you want something a little more challenging along while learning how to make subtle differences in your values, try creating a gray scale with 10 blocks. 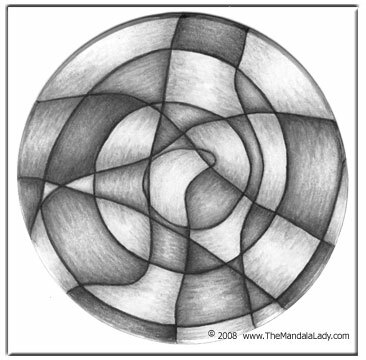 Create a doodle drawing and color it using various shades of gray, black, and white. Take a piece of paper, get something round that you can trace (plate, for example) or use a compass and draw out a circle. Then with a pencil, doodle one long line up and down and all round the circle. Now with all the different shapes that have been created, color in each one with difference shades of gray, black and white. Here’s one I did recently.